The Bibilical moniker Babel has been retired over at Google HQ, with the company's new unified chat system set to launch as Google Hangouts. That's the word we've had from our source at Google - the same person who sent us the screenshots of Babel in action a few weeks ago - after reports of the name change surfaced on the web. 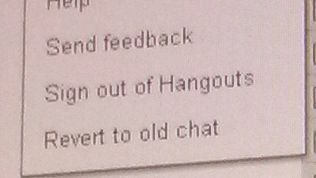 We've also been sent some new screenshots which aren't hugely illuminating but do show the service being referred to as Hangouts - "Sign out of Hangouts", for example. Those of you with functioning memories will know that Google Hangouts is already the name for video calling through Google+; the new service brings the branding to more services like G-chat. Not much else is new on the service since our last round of grabs, our source says, other than some emoticons being different colours. Do try to control yourselves. We were also told that Googlers received an email yesterday about Google I/O which thanked staff for their work on some of the products they've been testing, which our source says indicates that Google Hangouts will be unveiled for real at the show next week.